Israel has always been a standout destination. From the days of prophets to the modern day nomad this tiny slice of land on the eastern Mediterranean has long attracted visitors. While some arrive in the ‘Holy Land’ on a spiritual quest, many others are on cultural tours, beach holidays and eco-tourism trips. Weeding through Israel’s convoluted history is both exhilarating and exhausting. There are crumbling temples, ruined cities, abandoned forts and hundreds of places associated with the Bible. And while a sense of adventure is required, most sites are safe and easily accessible. Most of all, Israel is about its incredibly diverse population. Jews come from all over the world to live here, while about 20% of the population is Muslim. Politics are hard to get away from in Israel as everyone has an opinion on how to move the country forward – with a ready ear you’re sure to hear opinions from every side of the political spectrum. Few cities inspire as much passion as Jerusalem (Yerushalayim in Hebrew, Al-Quds in Arabic), rooted deep in the past and revered by three major religions. With its pleasant, temperate climate, fine upland setting, extraordinary historical sites and world-class museums, Jerusalem fascinatingly contrasts ancient and modern, oriental and western. The larger part of the city, including the city centre with its shopping and leisure district, is vibrant, Jewish West Jerusalem, characterized by broad avenues, busy pedestrianized streets and squares, cafes, restaurants and vivacious nightlife. Smaller East Jerusalem, predominantly Arab, is a 19th-century neighborhood lying north of the Old City. It has a slow but chaotic pace of life, with crowded, colorful street markets. 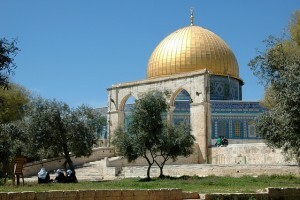 The Old City, on the eastern boundary, is where most of Jerusalem’s main sights are found. Enclosed within awesome 16th-century stone walls, are a labyrinth of winding lanes where visitors to the city spend much of their time. The Old City is divided into quarters, named after its four major communities in the 19th century: Arab, Jewish, Christian and Armenian, and preserving those sharp distinctions to this day. Within minutes, you may wander from calm squares where Jewish children play under the watchful eye of their mothers, to the hustle and bustle of an Arab souk, and into a tranquil Armenian garden, before arriving at the splendor of a medieval citadel. Jerusalem came into being over 3,000 years ago as the site of the Jewish Temple. The Western (or Wailing) Wall at the foot of Temple Mount is all that survives of the Temple, destroyed by the Romans, yet it remains Judaism’s most revered place of prayer. There are plenty of sandy, well-equipped beach resorts where you can sail, surf, swim or waterski or just sunbathe either at Eilat on the Red Sea, along the Mediterranean or even in Tel Aviv minutes from the city centre. The waters off Eilat are rich in coral and perfect for some underwater sightseeing. Scuba or snorkel on underwater trails, take a submarine tour, or just marvel at the scene through the windows of the Eilat’s amazing Underwater Observatory. Lying 400m (1320ft) below sea level and spanning the border between Israel and Jordan, the Dead Sea is a natural wonder. It contains more minerals and salt than any other stretch of water in the world, and thus it is possible to float on top of the water. Its natural properties make it a prime centre for spa treatments and relaxation therapies and there are a number of resorts in the area. The Dead Sea has strong Biblical connections: the salt mountain range of Mount Sodom is, according to the Bible, the site of the sinful city that perished alongside Gomorra. In turn, the Dead Sea Scrolls, the oldest Biblical documents known to be in existence, were discovered at Qumran, a restored archaeological site in the north. Masada is also located on the Israeli shores of the Dead Sea. The Ein Gedi Nature Reserve and Kibbutz provides opportunities for spotting desert wildlife and offers trails to waterfalls, canyons, caves and shallow pools. Metzoke Dragot, located in a deep crater, is a popular site for more adventurous sports such as abseiling, climbing (with amazing desert views) and mountain biking. Mediterranean, with a pleasant spring and autumn. Winters in the north can be cool. Occasional light rain in winter is possible, particularly inJerusalem, though recent years have seen insufficient rain. Snow is rare. Summers can be very hot, especially in the south. The Red Sea resort of Eilat has a good climate for beach holidays all year round. Lightweight clothes for warmer months are required. Mediumweights are recommended for winters, although on the Red Sea coast they are unlikely to be necessary during the day. There is a wide choice for shoppers in Israel. Contrary to a widespread belief among visitors, bargaining is not usual in Israel except in the few Arab markets. There are also very animated Jewish markets (shuks) of tremendous cultural diversity, notably the Carmel Market in Tel Aviv. The best place to buy food is at these outdoor markets; the produce is cheap and fresh. Tourists benefit from a zero rate of VAT (a tax on transactions) on many goods and services. In addition, when buying from souvenir and specialist shops displaying a Ministry of Tourism sign, especially jewellers and luxury good stores, it is possible to obtain a refund of VAT: when making your purchase, ask for a Tax Refund Invoice; then, when leaving the country, take the invoice to the tax refund desk at the airport or port for the VAT refund. Sunday through Friday, 8 AM – 7 PM; some shops close 1 PM – 4 PM and some early on Friday. Remember that Jewish-run stores close for Shabbat from Friday afternoon to Saturday evening, while Arabic stores close Friday. It takes a while to realise that Sunday is a normal working day unlike in Christian countries. For shoppers, Jewish stores are therefore open Friday, Arab markets Saturday and both are open Sunday when Christian stores close. Shops in hotels are often open until midnight. There are nightclubs and discos in most cities. Israel’s club scene, particularly Tel Aviv and Jerusalem, draws DJs and club fans from the USA and Europe. Tel Aviv has a wealth of entertainment and there are rock, jazz, folk and pop music clubs in all the main cities and resorts. Israeli folklore and dance shows can be seen everywhere, especially in the kibbutzim. Nightlife in Jerusalem is a little more muted but there are definitely a few good clubs, including the legendary Haoman 17. Israeli eating has distinctive characteristics, especially the fondness for fresh, finely chopped salads, eaten at every meal including breakfast. In general the cuisine is a fusion of East and West, plus many dishes and flavours brought by Jewish immigrants from all over the world. Most restaurants are moderately priced. Table service is the norm, except at the many low-cost snack bars. Restaurants, bars and cafés catering for tourists usually have menus in both Hebrew and English. Falafel (deep-fried balls of mashed chickpeas) in a pita bread, with hummus (ground chickpeas), Tahina (sesame seed sauce) and salads. Salads, which include savory vegetable dishes served cold, such as aubergines. Shishlik (charcoal-grilled meat on a skewer). Shwarma (slices of grilled meat served in a pita bread with salad). Ashkenazi classics like cholent (Shabbat meat stew) and gefilte fish, a white fish dish. Soft drinks (Israelis are among the world’s largest consumers). 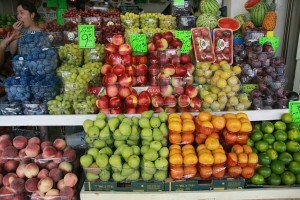 Fresh fruit juices are very popular and widely available, made from all kinds of fruit. The wines of Israel range from light white to dry red and sweet rosé. The best come from the Golan and Carmel regions. Gold Star and Maccabe (Israeli beers). Sabra (chocolate and orange liqueur). A centre for liqueurs is the monastery at Latrun on the road between Jerusalem and Tel Aviv. The Hebrew word kosher means conforming to Jewish religious laws. The laws include not eating milk, cream or cheese in the same meal as meat and avoiding pork and shellfish (although imitation seafood is common and may be indistinguishable from the real thing). A 15% service charge is added to restaurant, café and hotel bills by law. There is no need to add any further tip.